JobTrain is a 501(c)3 nonprofit educational and training institution accredited by the Western Association of Schools and Colleges. Each of JobTrain’s programs combines vocational training, academics, and essential skills development, preparing students to turn their lives around—from unemployment and poverty to success and self-sufficiency. Strong partnerships with employers ensure that students receive the training they need for employment so that businesses can find motivated workers who are well trained for their jobs. For 50 years, JobTrain has been adapting to meet current employment needs. Since its inception, more than 190,000 low-income individuals and their families have benefited from JobTrain’s programs. In 1964, Reverend Leon Sullivan started the first OIC Job Training Center in Philadelphia. He enlisted businesses and government organizations to help him train unemployed members of the community. After the students graduated, they were placed in jobs with the businesses who helped train them. It was a win-win – businesses had employees with the most desirable and necessary skills, and students found sustainable and rewarding careers. When Reverend Sullivan told business leaders about his idea, they said, “Oh, I see!” Fittingly, he named his training center OIC as a result. Meanwhile, across the country, Father John Sweeny was a pastor for an East Palo Alto church. He saw that in contrast to the surrounding towns, East Palo Alto was plagued by high rates of unemployment, poverty, and crime. He wanted to address this disparity and help his community members find and keep worthwhile and well-paying jobs. Using Reverend Sullivan’s ideas as a model, Father Sweeny recruited more than 300 community and church leaders to help. In 1965, they found an old warehouse at 1100 O’Brien Drive and transformed it into a training and job placement center. The new training center was called “OIC West,” or OICW. In 1994, OICW moved into its current location at 1200 O’Brien Drive in Menlo Park. The County of San Mateo opened offices on our campus in 1998, and both Cañada College and Sequoia Adult School have joined our campus as well. JobTrain is committed to helping those who are most in need to succeed. Our purpose is to improve the lives of people in our community through assessment, attitude and job skills training, and high potential career placement. JobTrain is a place where dreams come true. We create a unique opportunity for people to develop personal and career goals, and to achieve their aspirations by acquiring relevant skills and positive attitudes about themselves and their potential. People are drawn to JobTrain for our high-value training, effective personal development programs, impressive results, and respect for the individual. JobTrain delivers on the promise of a better life. JobTrain is founded on a belief in the potential of every human being. We believe that through training, encouragement and inspiration, our trainees will be empowered to become self-supporting and thriving members of society. JobTrain started in 1965 and has been a part of the fabric of the local community ever since. We are a community partner who understands that community is made up of residents, other community-based organizations, and regional employers. Committed to being responsive and collaborative, with programs designed to support all members of the community, JobTrain takes pride in our long history of inclusive and collaborative community engagement. The students and communities we serve provide input on program design and implementation. 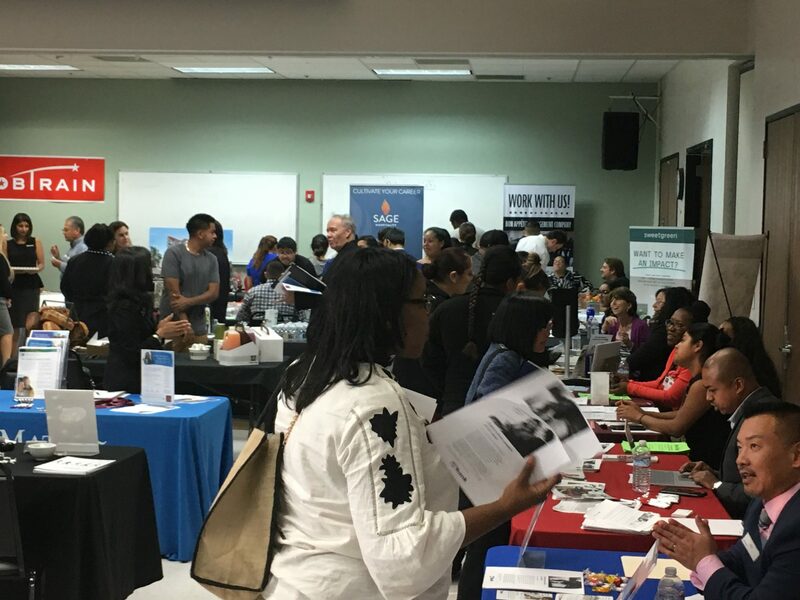 JobTrain’s presence is strong in many communities in San Mateo County, particularly in the communities of East Palo Alto, North Fair Oaks, Belle Haven and Redwood City. We believe in the dignity and potential of every individual. We believe that with opportunity and motivation, people will help themselves. We believe that people need and want a hand up, not a hand out.